Campbelltown Billabong: artist’s impression of the proposed water recreation facility at Bradbury’s Apex Park. A giant $18.75 million billabong in the heart of Campbelltown Council will mean local residents will no longer have to drive to Illawarra beaches for a swim on hot summer days. Council will hold an extraordinary meeting next Tuesday, August 28 to vote on the bold plan to build the Campbelltown Billabong at Apex Park Bradbury. The plans include a 1.5m deep swimming pool, waterfalls, an interactive stream and several other features. It is proposed that council will use the $15 million it is entitled under the City Deal’s Liveability Program to pay for what it hopes will become an iconic Campbelltown landmark. Under the Deal, the Liveability Program is intended to deliver “improved community facilities and urban amenity, and enhance liveability to enable and complement new housing supply,’’ according to a report included in the business paper for next Tuesday’s extraordinary meeting, which is open to the public. “Councils are each able to submit projects under this scheme to access up to $15 million in combined funding from the Commonwealth and State Governments for a project or projects to be carried out in their respective local government area, which is then to be combined with a required contribution from each council,’’ the report said. Campbelltown Council has to contribute $3.75m towards the nominated Liveability Program project, in this case the Campbelltown Billabong. Council officers have put together the Campbelltown Billabong plan and the first the elected councillors heard of it was at their weekly briefing last Tuesday night. 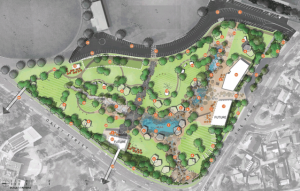 “The billabong concept draws inspiration from the Dharawal National Park, creating a series of rock pools along a meandering waterway that ultimately culminates in a billabong/lagoon type recreation facility,’’ says the report to council. connect the park visually and physically to its surrounds • create a safe and secure public space. act as an iconic destination feature for Campbelltown. Almost 40 years experience in the print media, most of them as editor of local newspapers across the Sydney metro area, but a few years working as a sub-editor with the metros. Lots of awards, both as a reporter and editor, but says he values just as much Community Service Awards from Campbelltown City Council in 2004 and 2016. Took a voluntary redundancy in 2014 from Fairfax Community Newspapers after 21 years there. Loves the digital world, because ''there's no question it's the future''. Eric promises his hard hitting but fair approach won't change when he reports the news via cyber space.